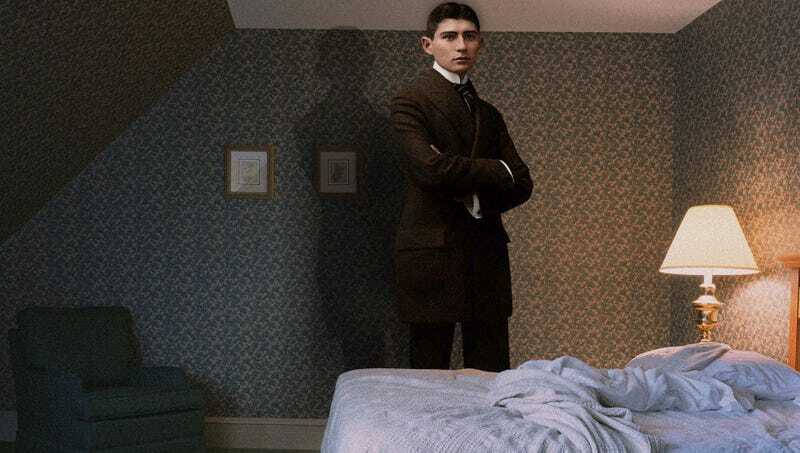 DES MOINES, IA—In what experts are calling a bizarre and confusing incident, local man Allen McIntire reportedly awoke from troubled dreams Tuesday to find himself transformed into a gigantic Kafka. Sources confirmed that the traveling salesman, 30, remained in bed for several minutes after waking, struggling to come to terms with the revelation that his body had somehow taken on the monstrous form of the acclaimed novelist and short story writer during the night. McIntire, upon hearing his mother knock on his bedroom door, attempted to call out to her but was reportedly dismayed to discover he was only capable of communicating in a guttural Czech patois that was incomprehensible to everyone in his family. After opening the door, McIntire’s mother was reportedly aghast at her son’s huge, suit-and-tie-adorned body as McIntire skittered out of bed and towards a typewriter on his desk, where he was overwhelmed with the compulsion to write surrealistic satires lampooning the existential horrors of bureaucracy. At press time, after realizing the economic burden he was placing on his family due to his new, grotesque shape, McIntire had reportedly succumbed to laryngitic tuberculosis and died in obscurity.